Third party certification tests and verifies a products design, performance, manufacturing process and quality assurance from manufacture to installation. When the performance of a product has been determined through testing, assessment or calculation, this can be used to show potential clients that your products meet their specified criteria. However, a single test only shows the performance of the particular samples that were tested. Can the results of these tests be applied to all other products of a similar type and if so, can the performance be assumed to apply for one year or perhaps two years? How many years? It is possible that, over time, variations in the original design have been made. Perhaps there has been a change in material or a change to a lock or hinge. Would these changes have affected the original tested performance? Who justifies the continued claims of performance? Certification, offered by an independent third party such as BSI, Warrington Certification and the Loss Prevention Certification Board, provides the ongoing assessment of a product year-on-year, giving assurances to your customers that the performance of your products has remained consistent with the original test evidence. Certification schemes usually incorporate audits of the systems that are in place, controlling the manufacturing processes and quality management, and these are combined with audit testing of product samples. 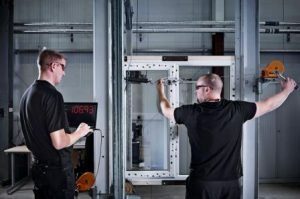 The timescales vary from scheme to scheme, but it is usual for the Factory Production Control (FPC) and Quality Management Systems (QMS) to be reviewed twice a year with the period between audit testing varying from one to five years, depending on the type of testing required. Another element of certification schemes is their labelling requirements, which show the performance of the product and can enable traceability back to the manufacturer. The certification body will also provide a scope or assessment based on the original test evidence and the on-going audits that show a customer the size range and product types to which the certification applies. Some schemes, such as Secured By Design, require certification as one of their conditions. Secured by Design requires that timber windows, for example, are covered under a certification scheme for general performance (BS 644) and enhanced security (BS 7950). In most areas certification reassures a customer that the product is suitable for its intended use and the labelling requirements of the schemes can be used to identify the products and their performance levels throughout their working life. This is particularly useful for fire doors where, without the labelling, the door could not easily be identified as a fire door. What certification and accreditation schemes are available through the BWF?